Something that frustrated me when I began living gluten-free was the lack of options for eating gluten free sushi out. I could order gluten-free rolls, but not dip into a blend of wasabi and soy sauce, which completely changes the experience. I tried it once, actually, and then limited myself to salads when we ate out. The high-end sushi restaurants, are accommodating, always having tamari as an option. These restaurants, however, are not the ones I would take the kids to after baseball practice or for a quick lunch out. I consider these restaurants as “date-night sushi.” I was more concerned with eating gluten-free sushi at our favorite sushi restaurant, which is walking distance from our home, and the one we frequent most often. After the frustrating dining-in experience, we started ordering take out so that I had a bottle of tamari on hand for our sushi dinners. But when your family devours a roll you love, there’s no option to order another round. This quickly became a frustrating experience as well. Still in the not-wanting-to-draw-attention phase to my new gluten-free life, I never thought to pack a tamari bottle with me when eating sushi out. As I became more brazen in my gluten-free living, I did start to pack a bottle. But it required a purse large enough to hold it and wasn’t always the easiest solution. Enter San J organic gluten-free tamari soy sauce travel packs. 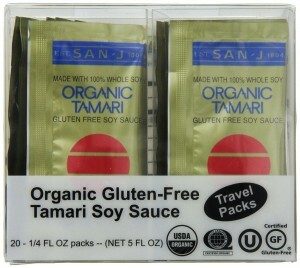 These little packets were a life changer for eating gluten-free sushi out. As small as a ketchup packet, the individual serving packs are easy to carry to restaurants, but also travel well. I highly recommend them for your next gluten free sushi night. 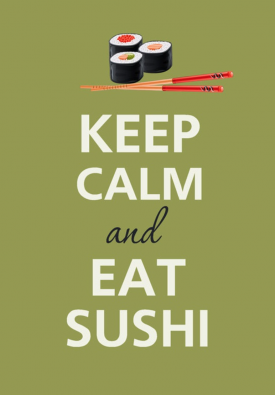 Tell us: do you have any tips or tricks with eating gluten-free sushi? Next post: Gluten Free Trend: Helping or Hurting the Community?